Joni Mitchell used to be a giggly folk singer. Now her music has moved closer to jazz. But her songs still have a message. She talks to Adam Sweeting about the people who think her music belongs to the devil. "I'm a lucky girl, "sings Joni Mitchell in a song from her fourteenth and latest album, DOG EAT DOG. She has staying power too. In 1970 Graham Nash wrote Our House about his life with her, while her own song, Woodstock, celebrated the high tide of hippiedom. Nash still sends her flowers on her birthday and attended her wedding to co-producer and musician Larry Klein in 1982. Maybe it's something about Canada, but Mitchell, born in Alberta and raised in Saskatchewan, shares a capacity for survival and change with her Canadian contemporary Neil Young. Lately, Young has headed back to the country and developed an inexplicable fondness for Ronald Reagan. Joni Mitchell had headed the opposite way. Her new songs are sophisticated but accessible, and are the first she's released since her LP WILD THINGS RUN FAST three years ago. They reflect varied cultural, social and political concerns. "Neil and I were similarly affected by things and yet had opposite reactions," she reminisced, in London to promote the album. She was dressed in a long red cardigan, dark trousers and a beret, appropriate clothes for a woman committed almost as much to painting these days as she is to music. "We have so much in common — we both come from the Canadian prairies, we both had polio in our right leg and our back in the same epidemic in 1953. We made our exodus from the prairie to Toronto, which was the music city at the time, at approximately the same age — he's a little younger than I am. We both ended up in California, where I introduced him to Elliot Roberts, who was my manager, who became his manager. Mitchell is far from being the breathless, giggly folk singer who made her recording debut in 1968. For 10 years or more her music has owed as much to jazz as to rock. Most of all, it hinges around her singular and personal conception of melody and harmony. "I made a shift into jazz out of necessity," she explained. "I had two choices, either to continue to play by myself or to play with jazz musicians, because rock'n'roll musicians could not hear the voicings that I used. To them they were weird chords, they couldn't understand them, and what they would play against them would kill off the internal harmony." "Finally someone said to me 'Joan, it's apparent that you're gonna have to play with jazz musicians,' so I started searching around in the clubs. Even they found the music quirky." She describes her musical evolution as "an intuitive process — idiot-savant," phrases typical of her oblique imagination and slightly ornamental vocabulary. When she talks, it's as though her mind is shuffling several possible answers and sifting out the most appropriate choice, which is not always easy. Pressed on the subject of her new song Tax Free, an alarming investigation of America's right-wing evangelists with a spoken narration by Rod Steiger, Mitchell's descriptive powers are taxed to the utmost. "Reagan feels that Armageddon is inevitable and it's dangerous when you have a President who thinks that way since he's the one who can call for the pushing of the button. He sees himself in his personal drama, I think, increasingly as a religious leader and he has public lunches with some of these very powerful evangelists, Pat Roberts and the 700 Club for instance. "In other words, you have the church stroking Reagan and saying "yes, yes, aren't they saying nasty things about you, they must be communists. Therefore they threaten both you and me. Don't you think we should silence these communists from speaking?'" She laughed, high and nervously. "This is my vision. I get like a zealot. It's scary to me because it threatens freedoms of mine." She's convinced that rock music can, indeed must, make a stand against a Moral Majority keen to impose restrictions on it. "There's one preacher in particular who beat into his congregation that rock'n'roll was the devil. Why are they making it an enemy? Because it still has a voice. Well then, let it be a worthy foe. Suddenly I felt a responsibility, use it or lose it. There's a definite battle going on here and people's rights are at stake, and the diversity that America always promised is being threatened." Her attitude to rock's great crusades of the last year, against famine in Ethiopia and apartheid in South Africa, is less impassioned and more equivocal. Her song Ethiopia questions the way the West treats that country as a problem "over there" rather than as part of a growing ecological crisis which threatens to engulf the entire planet. "This, to me, is the issue of unification. It concerns everybody, so further isolation by drawing religious barriers at a time like this and creating more friction when we're all in the same ecological mess seems to me a very short-sighted obsession." Mitchell was invited to contribute to Little Steven's all-star Sun City recording but declined when she discovered that the original Sun City lyric singled out her friend Linda Ronstadt for having performed in South Africa. "I know Linda played there in all innocence, being an apolitical creature who felt that art should cross any border. I'm not opposed to that point of view. I don't see her as having committed any great crime, and yet they would have crucified her in this verse, which tastefully they left out in the end. Y'know, when we start with hunting among our own peer groups..."
Stars, of course, have the luxury of choice in these matters. 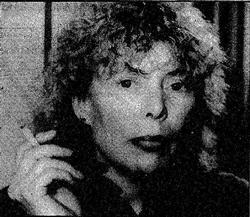 Joni Mitchell may go on tour in 1986, or she may stay at home and try her hand at writing short stories. "Right now I'm at an epic part of my life where I'm remembering things from way back that I may not remember again, and I wonder if 10 years down the line this kind of thinking will occur again. Perhaps it's the time to capture them." This article has been viewed 3,728 times since being added on February 15, 2009.